When last we heard from Flat S, she had been kidnapped by pirates who were setting out across the Atlantic to points unknown. Shortly after that post was published, a message in a bottle washed up along shore in the East River near our apartment. It was from the pirates, and it contained a ransom demand. In exchange for a small selection of patterns and some yardage from past Oliver + S fabric collections, they would turn her over to us when they made landfall in Spain sometime in August. We immediately pulled together the ransom, packed our bags (including a change of clothing for Flat S because she had been wearing that poor Family Reunion Dress for more than a year), and booked a flight to Barcelona. Upon our arrival, we were given instructions for making a dead drop of the ransom payment. 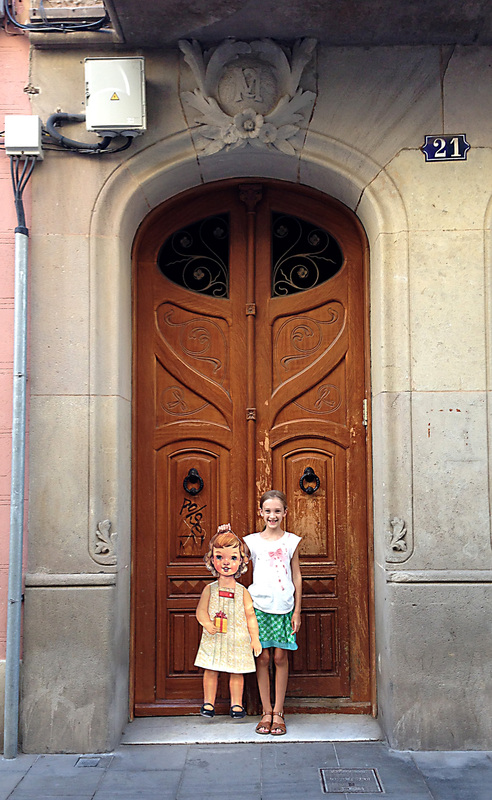 We did as instructed, and the next day, Flat S slid through the mail slot of the apartment where we were staying. It was great to see her again after a year and a half! We decided that as long as we were all together in Barcelona, we might as well see some sights and get some work done. And Flat S got to tag along. We started our time together by doing some sightseeing. 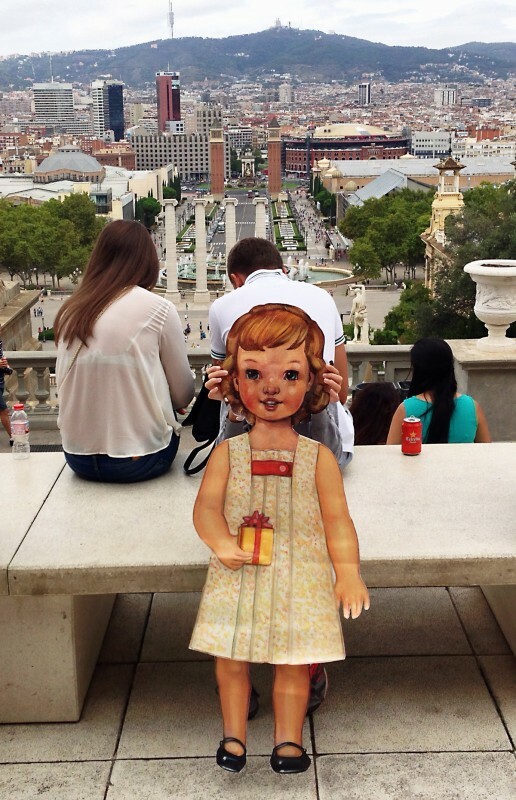 Flat S joined us for a day of walking around Montjuïc. 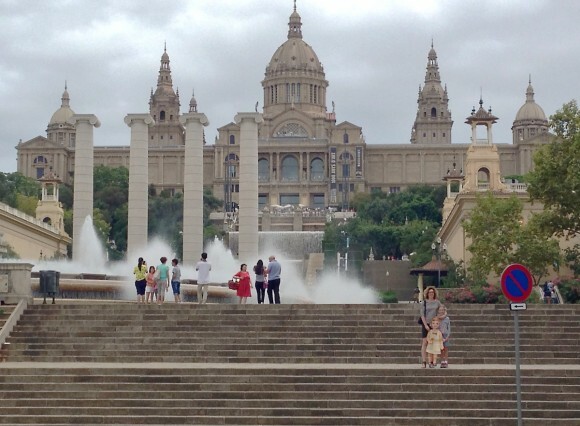 The hill was walking distance from our apartment, so we went on foot and stopped at Plaça d’Espanya on the way. 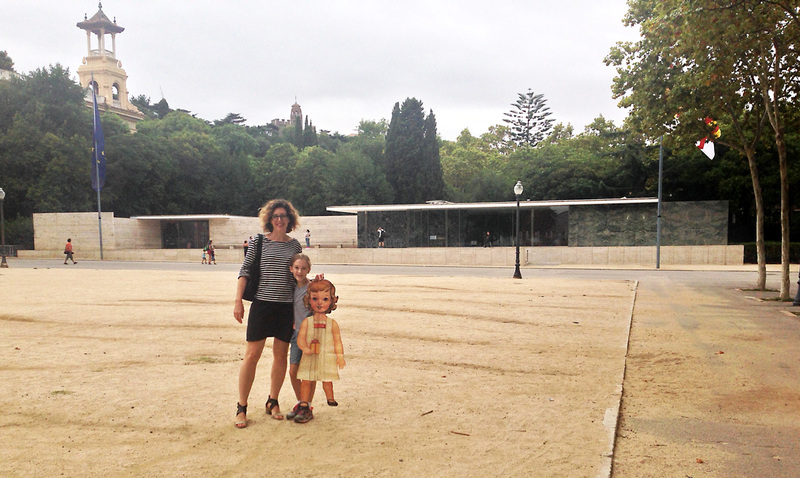 Before heading up the hill, we stopped to see the reproduction of the German Pavilion designed by Mies van der Rohe for the famous 1929 International Exhibition held in this area. This building is seen as one of the first examples of modernist architecture to be realized, and it introduced the world to a new way of thinking about building and using space. After that, we made our way up the stairs, past the Magical Fountain, to the entrance of the Museu Nacional d’Art de Catalunya which is one of our favorite museums. The building that houses the museum today was also built for the 1929 International Exhibition. It’s interesting to see just how different contemporary architectural styles were from what Mies did for the German Pavilion. Upon reaching the top of the stairs, we had a great view down over the city. We spent a nice afternoon at the museum and were excited to see two of our favorite paintings again–Ramon Casas and Pere Romeu on a Tandem and Ramon Casas and Pere Romeu in a Motor Car. Painted in 1897 and 1901, these two pieces are often described as representing the nineteenth and twentieth centuries, respectively, with their transition from bicycle to automobile. 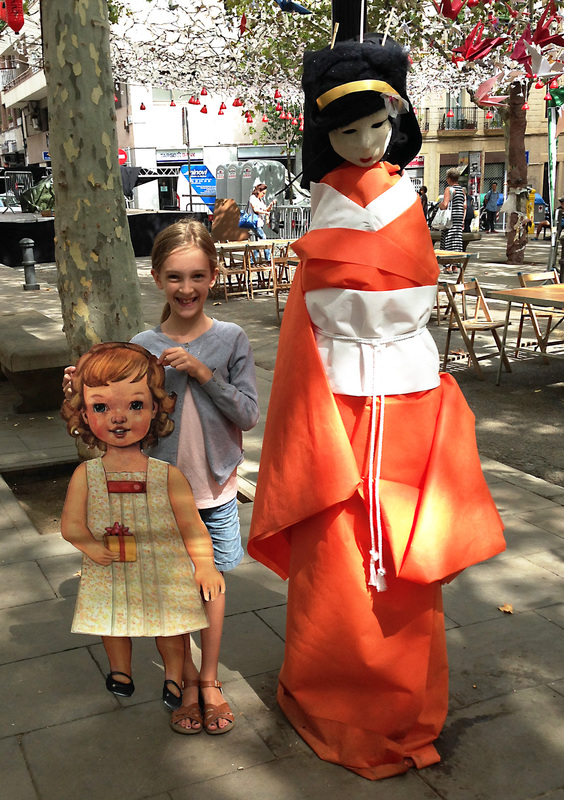 We were fortunate that during our time in Barcelona it was festival season. 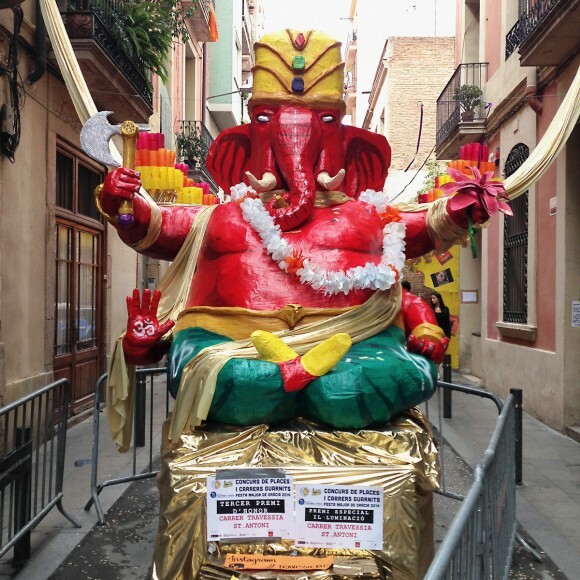 During its festival week, each neighborhood has a competition between blocks for the best decorations. 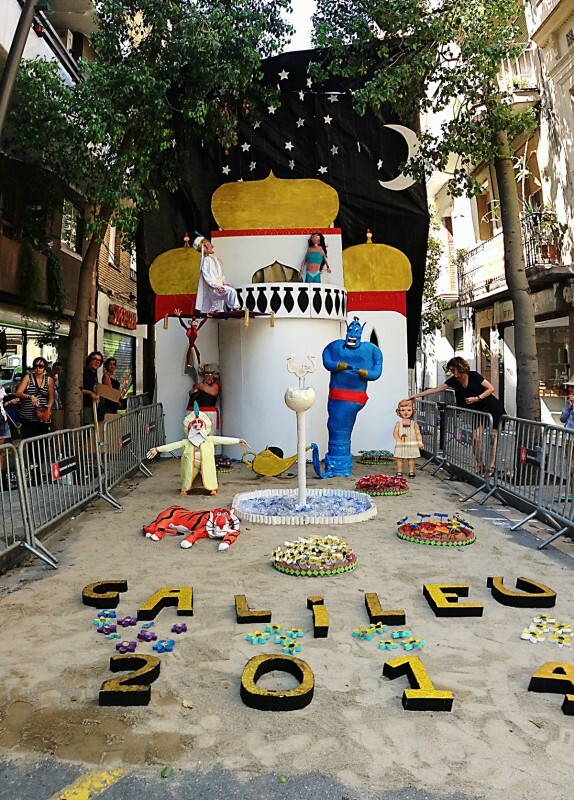 Every participating block selects a theme and spends several weeks prior making its decorations. All the decorations are made from recycled materials. 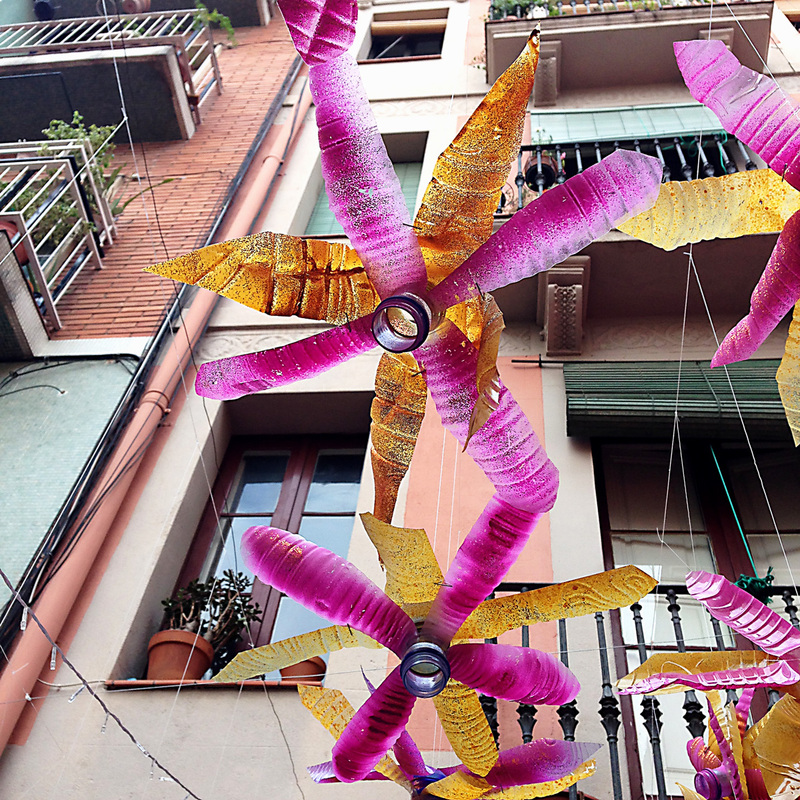 We’ve never seen plastic water bottles and paper mache used in such creative ways. 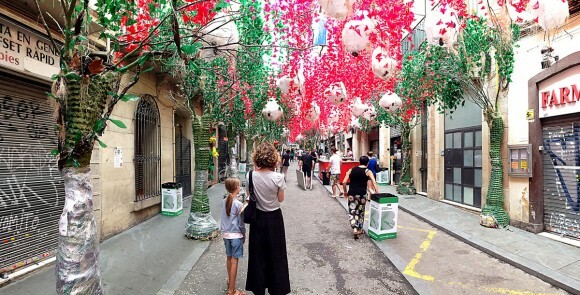 During festival, the streets are shut down, and the neighborhood comes together to hang its decorations. And what a spectacle it is! 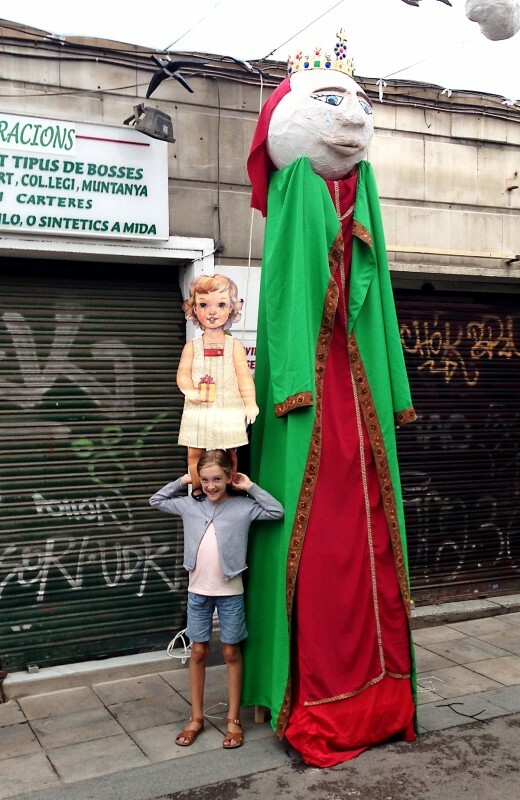 Shortly after Flat S’s arrival, it was the neighborhood of Gracia’s turn. 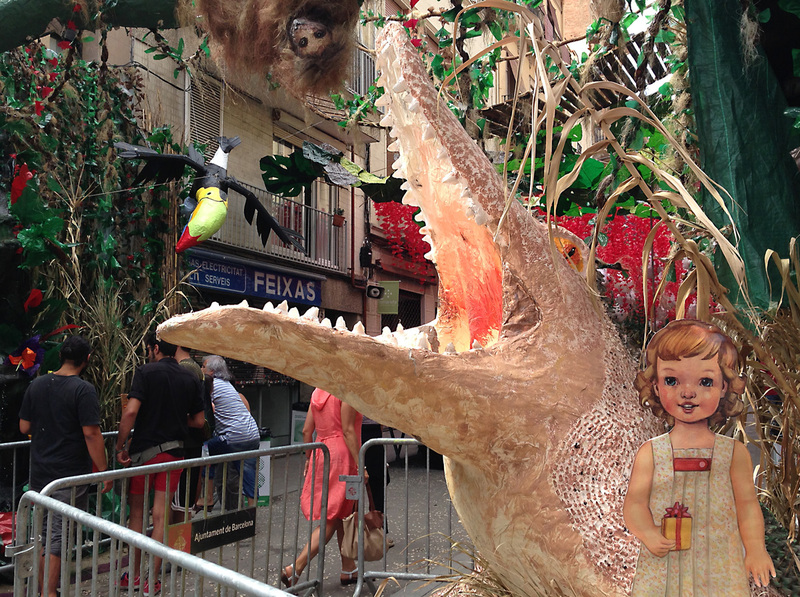 Gracia is well known for developing the most spectacular decorations, and we were all very impressed. The second week of her visit, it was our neighborhood’s turn. 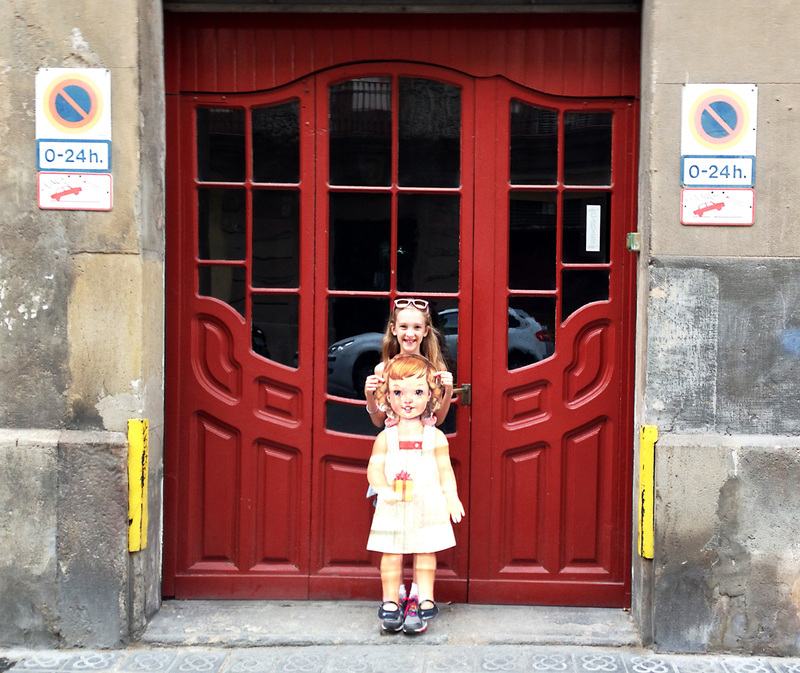 Sants, where we were staying, is a nineteenth and early-twentieth century factory village that over the years has been de-industrialized and subsumed into Barcelona as the city grew. While our neighborhood’s decorations were not as extensive as those we saw in Gracia, they were still impressive. Our street was decorated with an Aladdin theme. 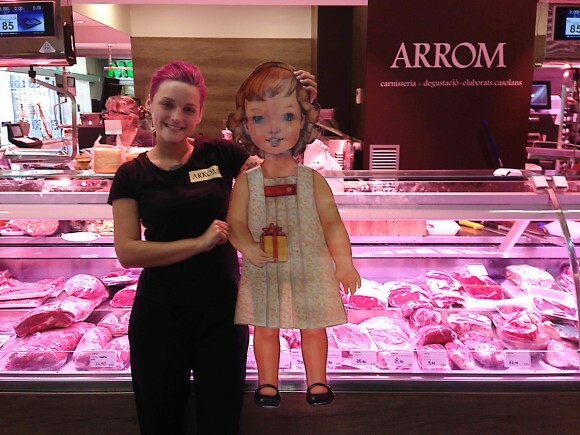 Here’s Flat S slipping inside the barrier to pose with a few of the characters. In addition to the decorations on all the streets that are shut down for festival, the blocks set up temporary bars that are staffed by neighborhood residents. Tables and chairs go into the street, and the impromptu taverns open up each afternoon. Additionally, many of the neighborhood restaurants bring their tables out into the street. Each street that is decorated also assembles a stage and puts together a schedule of musical entertainment. Bands ranges from traditional Catalan orchestras (which are heavy on oboe-like instruments and brass and which occasion traditional circle-dancing in the streets) to Rolling Stones cover bands and everything in between. This being Spain, the country where no one sleeps at night, the music starts each evening at 11 PM and goes until 1:30 or 2:30 AM—with people sitting and drinking in the streets until after 3 AM most mornings. In between enjoying the food, drink, music, and decorations, Flat S enjoyed meeting many of the locals. She wasn’t bashful at all after her year of traveling by herself, and she would walk right up to interesting people she met on the street and in the subway to introduce herself. 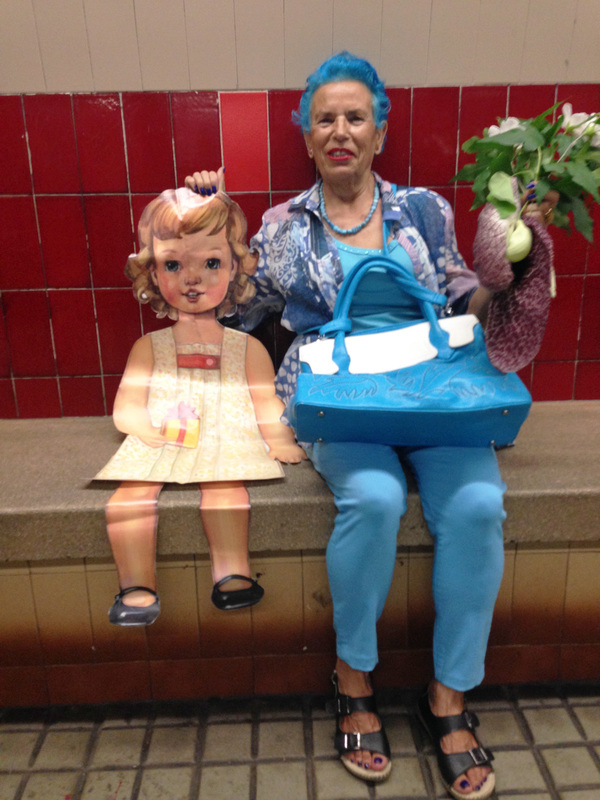 Here Flat S is with a lovely lady we met waiting for the Metro one day. She said English people (because we speak English, everyone assumed we were from the UK) always ask her if they can take her picture. We didn’t ask, but we’re pretty sure her favorite color is blue. 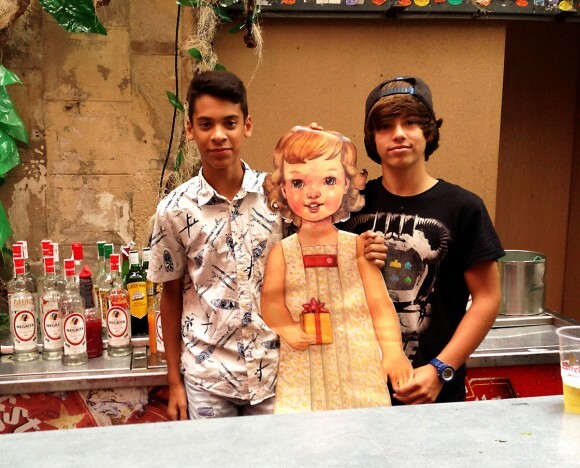 Flat S also pitched in one day to help two young guys behind the bar at one of the festivals. And she hung out with this posse one afternoon. 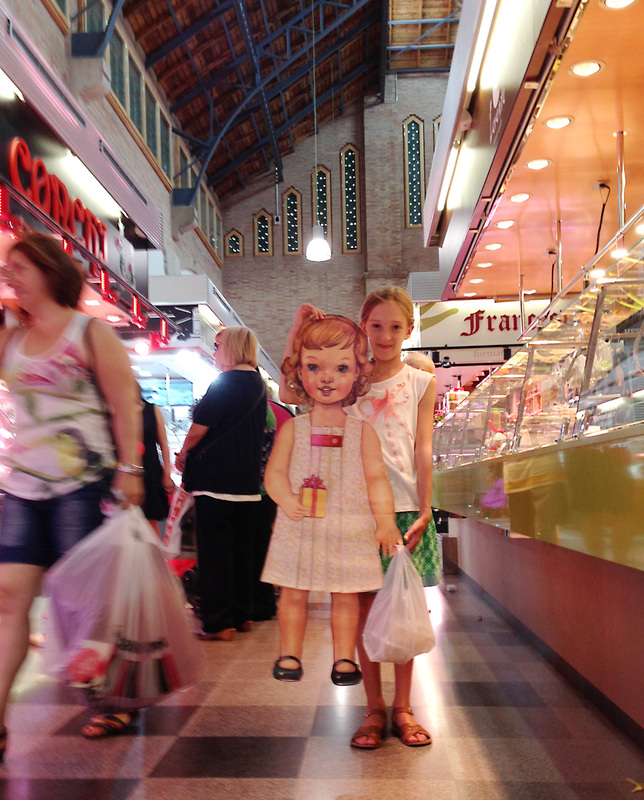 She really enjoyed shopping at our local market where the vendors carried fresh produce, fish, and meat. If you follow Liesl on Instagram, you’ll know about the door photo bombs she and S do wherever they go. 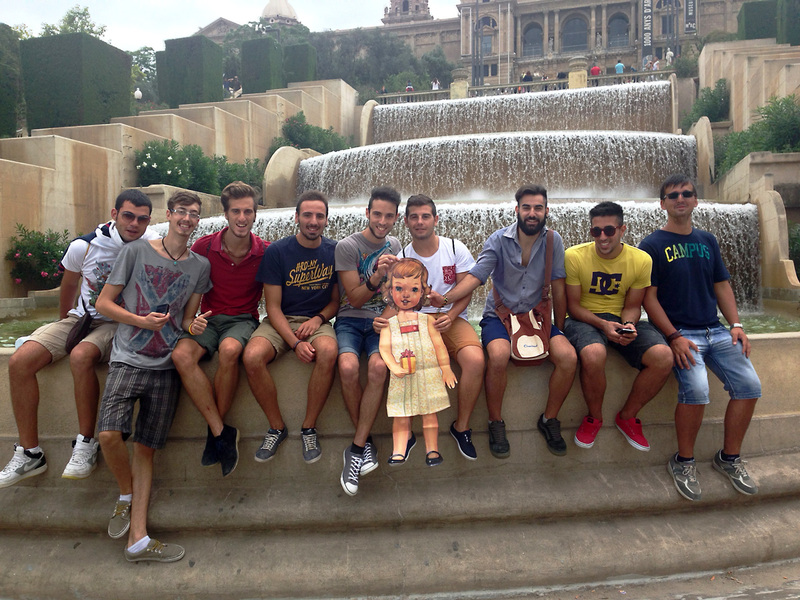 For a few days in Barcelona, Flat S got to join in on the fun. 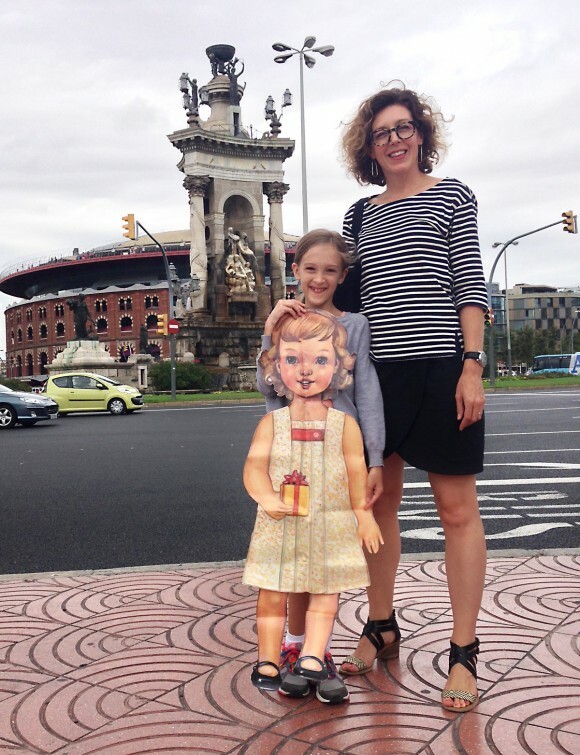 On one of our last days in Barcelona, Flat S helped us with a photo shoot we scheduled for this fall’s newest Liesl + Co. patterns. But, sadly, our stay had to come to an end. When it was time for us to head home to begin the school year, Flat S refused to get on the plane. 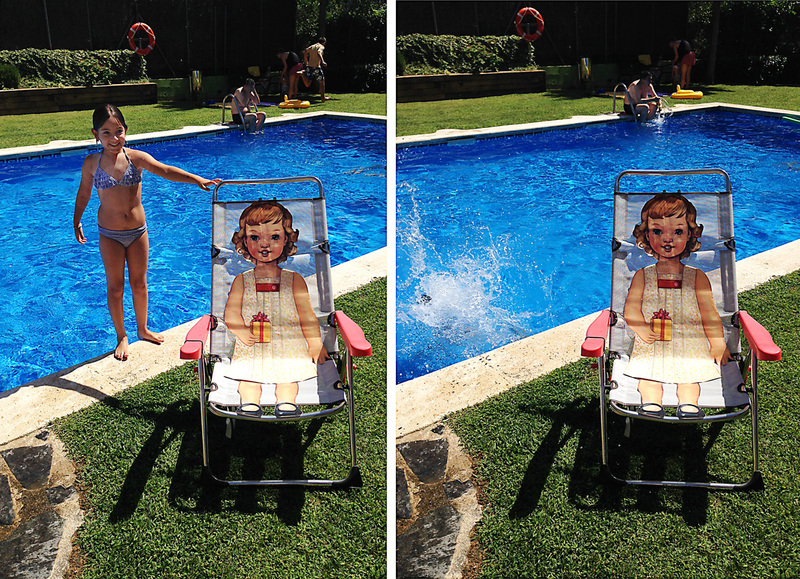 The weather was too nice in Spain, she told us, and she was enjoying her time there too much. 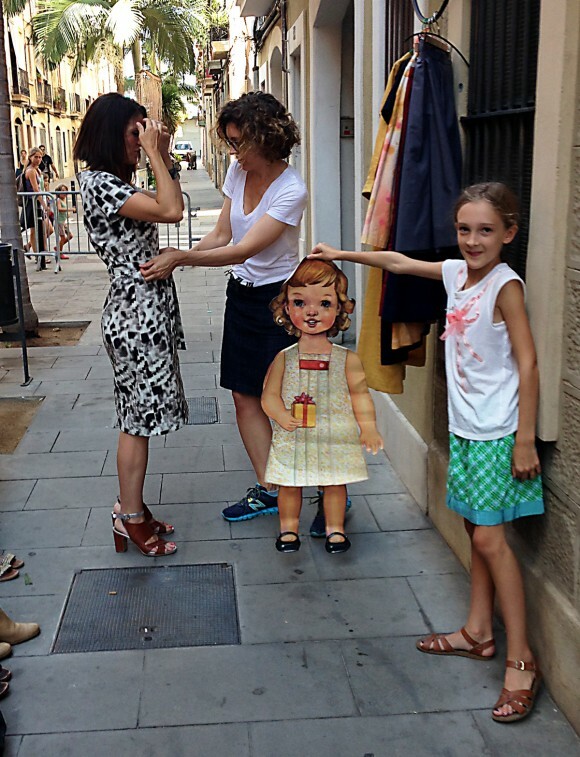 On our last day in Spain, we took Flat S with us to visit friends down the coast in the beach town of Castelldefels. 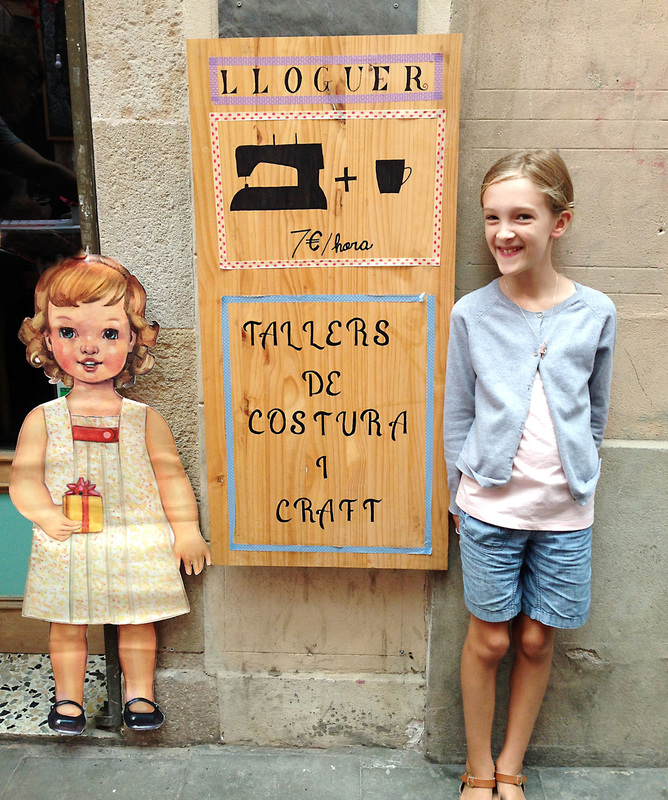 Flat S had such a great time that day that she decided to stay right there when we headed back to Barcelona to catch our flight home. 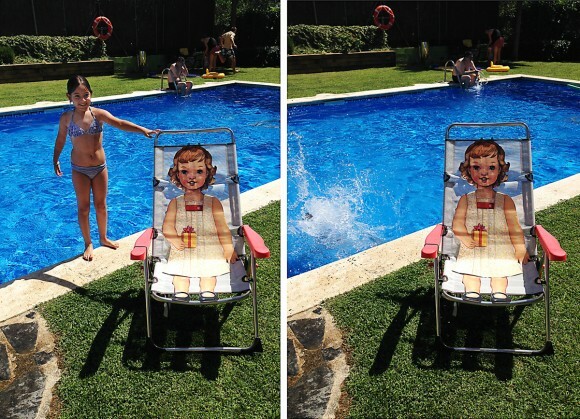 So we left her in Castelldefels, sitting by the pool. We’re sure she’ll find some new friends who will take care of her and show her even more of Spain before she moves on to wherever she is headed next. As always, we’re excited to hear about her next adventures! so cute. and it was fun to see a sneak peak of the new patterns. can’t wait to see them in full view. Arrrr me hearties! Yer shore leave photos be wonderful and that scally wag lass certainly had a jolly time! But be a-feared ’tis may not be th’ last ye’ll hear from us! 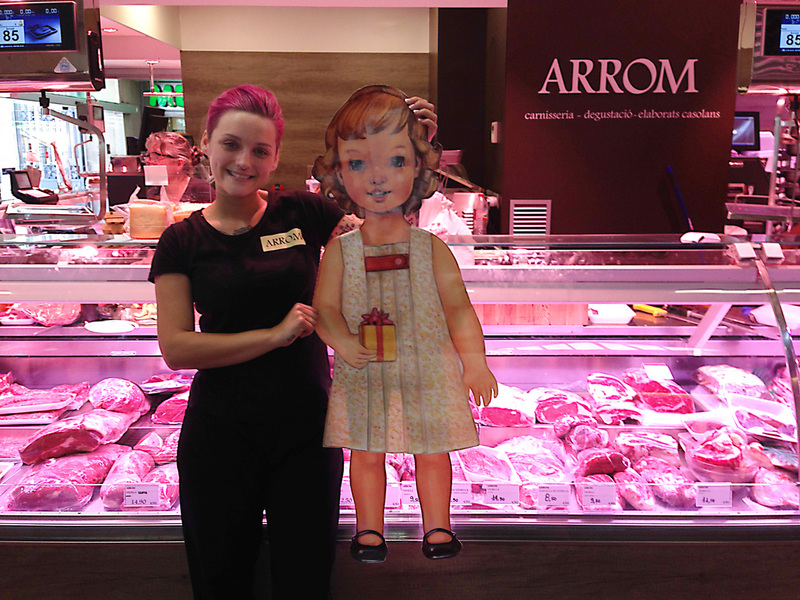 Liesl, I love this! What a great thing for all of us and for your daughter! Cheers! Que vida tan emocionante la de Flat S, piratas, viajes, gente nueva e interesante…. Estoy ansiosa de ver que le ocurrirá en su próxima parada…..
Please,please, please say that fabulous black skirt you are wearing in the first picture is one of your new patterns! It is fabulous! Flat S is such a great guest!! She eats and sleeps properly, and she is always willing to visit a new place and meet someone new. 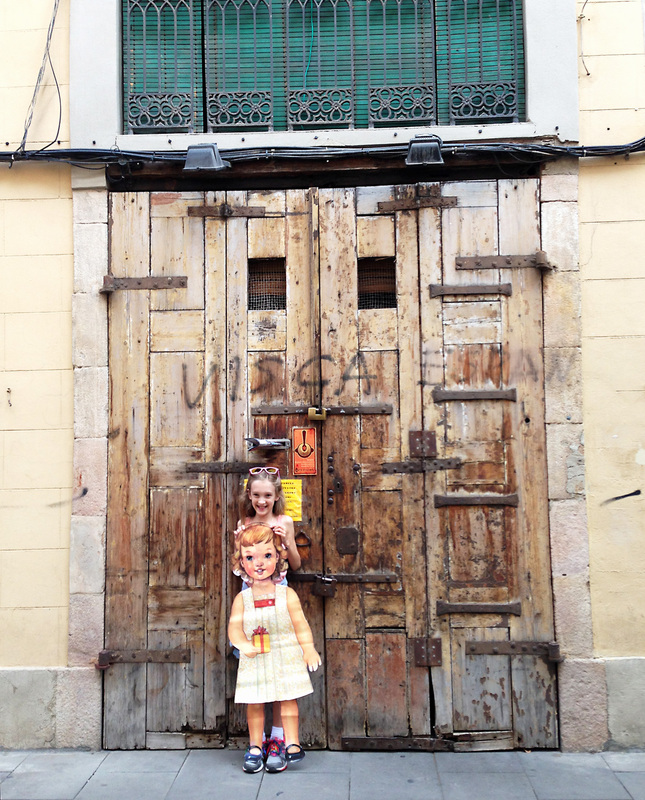 Such is her desire for adventure that I sent her on a trip around Spain to visit some of my friends that will take good care of her. What will her adventures be? That is going to be fun! !